Split EP by two quite old Canadian crust bands. It comes in a typical minimalist photocopied crust punk artwork, but despite the awful print of the covers, the vinyl itself (at least my copy) is nice transparent green 7″. 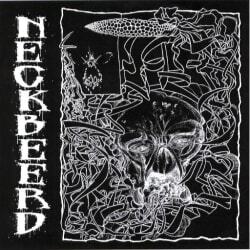 In their five tracks Neckbeerd are mixing crustcore and crossover. They’re a nice band, but at certain points the crossover is just too much for me. On the other side we have four songs by the oldschool grind-crust outfit Suckcess, who are playing the kind of style in the vein of bands like Britain’s Extreme Noise Terror or Filth from the US. It’s a decent DIY crust record with its enjoyable dose of distortion ’till deafness.